What do you do when you can’t do what you do? In case you didn’t know, or you are new here, I am an artist and when I do drawings for clients some of them have deadlines so that means drawing, sometimes but not often, when I’m not particularly inspired in order to get it done on time. I am always inspired by something, though, and I’m either doing little sketches, full drawings, or at least writing about it in my journal most everyday. And I love to write hand-written letters to friends as well, so I’m never without pen and paper close by. So a couple of months ago I began having pain in my right wrist and into my thumb off and on mainly when I would lift something heavy with that hand but also at night after drawing all day. As time went on I would occasionally wake up with my thumb joint locked. It would snap painfully when I’d try bend it until it loosened up, be sore for a few minutes and then feel okay. 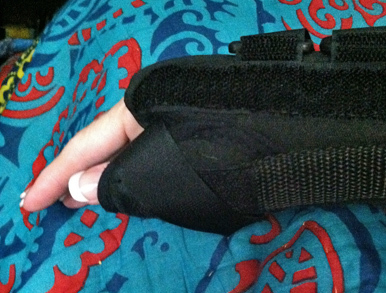 So I did some reading about “trigger finger” or “trigger thumb” and tried not to lift anything or strain my thumb. Otherwise, I continued doing everything else as usual including typing, writing, drawing and drawing some more. During November and December I draw a lot more than usual but I had no idea that I was over-working my right thumb. Apparently I was. I use mainly graphite, color pencil and pen & ink in my work so that means holding these small objects for a long time at one sitting. I also have discovered that I am holding them too tightly as well as too long. I also have discovered after questions from my doctor and physical therapist that I also tend to hold several other pens that I am not drawing with in my left hand as I work. I know, how did I just discover that fact? I have no idea. I’d just never paid any attention to it until they asked about why I had such little range of motion in my left pinky finger. Now to the reason for this little post . . . I don’t know what to do when I can’t write or draw. I used to think it was bad when I didn’t want to work on a particular piece but now that I can’t work on anything worse. Like, “you don’t know what you’ve got ‘til its gone,” kind of thing. I have been reading more and taking a few more photos than usual to help with creative withdrawal but that’s it and its not working. I listen to music a lot but I’m usually doing something else at the same time so I have been spending a little more time just sitting quietly and really listening. It’s something that I always have done but not nearly enough lately. It makes me feel better but there’s still this emptiness. I need to put pen or pencil on paper! I have a feeling that there’s a reason for this in some way. Maybe for me to learn something new like not to over do it even if there are deadlines. But for now I must ask those of you who read this, what do you do when you can’t do what you do? Tags: drawing, trigger thumb, working artist | Permalink. I have a photo blog and my art site, but recently I decided that I need a place to keep everything together. My thoughts, my photos, my art, my friends are all linked here on the right side. It’s a place where you can see what’s going on with me and also visit my other sites from here as well. A sort of online journal for me I guess. Now, a little about the title, A Feather On The Beach. One of the things that I love most is to visit the beach. I feel at home there and have since I was four years old. I love to collect seashells, driftwood, etc., but I always notice when there would be a feather on the sand as well. I always wonder what bird dropped it and where he or she may have been going as they flew over the ocean. It was like a little token they’d left behind saying, “I was here”. That is how I feel about this blog. Tags: art, journal, photos | Permalink.